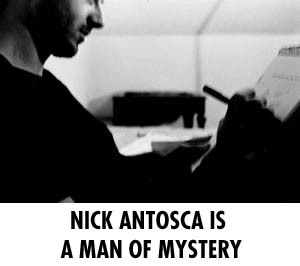 Nick Antosca is most recently the author of Midnight Picnic. Condition of Mr. Segundo: Terrified about what his ex-wife does during a midnight picnic. Subjects Discussed: The lack of picnics in Midnight Picnic, Jackie Corley’s confusion with the title, Midnight Picnic vs. Midnight Panic, dream logic, mouth birth dogs, Mr. Antosca’s lifelong dog trauma, writing about dogs being hurt, being self-conscious about writing, Charlie Huston, interviewers who use the phrase “blown your load” in relation to Mr. Antosca, Ned Vizzini, drinking as the natural fatal flaw for a homicidal maniac, short sentences, word counts and trauma, James Salter and ghost stories, the two year waiting period before assessing, unconventional chapter headings, the geography of the afterlife, tumbling into other memories, smell of the living vs. smell of the dead, the relationship between lap dancing and rigor mortis, dining experiences at Roy Rogers restaurants, New Orleans, the reality of midgets, high school deaths, “Appalachian monsters” in Florida, breastbone descriptions, razors with frightening blades, blocking, 2666, on being self-conscious and subconscious while writing, “You can’t take the dogs out of Nick Antosca,” science and melting pit bulls in an Antosca screenplay from the early years, the last-minute publishing shift from Impetus to Word Riot, the Clinton and Obama of publishers (but no Bush apparently), the publishing apocalypse, working a day job, writing for the now defunct New York Sun books section, demand for Antosca’s work, and anxiety. Correspondent: Do you have any personal experience of putting your mouth around a dog? How did this come about? It’s rather extraordinary. There are four of them. Antosca: No, I can’t. I don’t know where that came from. I think the idea was just that there had to be something pretty disturbing that this kid wanted to do to the man who had killed him. Well, I don’t want to describe what the mouth birth dogs are too much for people who haven’t read the book. But it’s supposed to be a shocking moment in the book, and kind of disgusting and disturbing. Correspondent: Enthralling, I would say. Correspondent: But then that’s just me. Antosca: I hope it’s pretty memorable. But I don’t know. I can’t remember where the idea of them came from. I think I saw a picture of a giant Continental Rabbit somewhere. I think these are rabbits. They’re as big as dogs. And they’re sort of cute and sort of disgusting. And for some reason, I pictured that as half-rabbit and half-dog, and that became this image. Like I said, with this book, I was willing — like I encouraged myself to just follow imagery where it would lead. Correspondent: Is there something in the obvious spelling scenario? In which dog spells “god” backwards. That this might be your inverted way of coming to terms with a potential deity. And the fact that it comes from the mouth as opposed to from the skies. I mean, I don’t know. You tell me here. Correspondent: Are you a religious man, Nick? Correspondent: Okay. So the dog is your religion then? Antosca: Well, the idea of the dog god mouth is a pretty fascinating question. I don’t think that my interest in dogs has anything to do with concern about god. Or whether god exists. I think it’s more a concern about possibly being betrayed by something that you trust, aren’t close to, and think is not ever going to harm you. You think of a kid and his dog as a pure relationship. And the idea that it might turn on you and shred you is sort of compelling. Antosca: The idea that you might still feel an allegiance to that animal. It’s almost a cliche. The idea of the kid being attacked by the dog when the parents want to put the dog to sleep. “No! No! Don’t do that!” Which I think is what I remember from when I was five or six. When that happened.